Picture this: 61% of B2B marketers send all leads directly to sales; however, only 27% of those leads will be qualified. Sound familiar? Have you ever wondered how to separate the sales ready leads from the ones that aren t quite there yet? The answer lies in the missing link to your current marketing strategy. lead scoring. Since its inception, lead scoring has played a major role in helping companies to prioritize and qualify the best leads for sales. It increases the effectivness of marketing and sales efforts by aligning the two departments and developing a common language to discuss both the quality and quantity of leads. Despite the growing interest in lead scoring both in B2B and B2C, companies are often in the dark on how to plan and implement a successful lead scoring program. Fear not, here s a step by step framework to follow to help you develop a strong lead scoring strategy. The first step in developing a strong lead scoring strategy is making sure you re familiar with the the two elements that make up your lead scoring program: explicit and implicit scoring. Explicit scoring is creating values based upon information given by the client or data that you can directly observe that would indicate an interested party. An example would be lead information collected on a form from a visitor. Implicit scoring on the otherhand, is much more complex and is based on tracking the digital behavior or activity that leads to a sale. A few examples of the behaviors tracked are most visited pages, emails opens, content downloaded and much more. When you score and combine the efforts of these two elements, you gain a clear picture of the leads that are sales ready. Take-away. Don t just settle for identifying the behaviors, strive to identify the importance behind the behavior. Discover the levels of interest are they exploring a product page or returning to a case study? Both show interest but the last one may show a higher level which should be reflected in their score. Always be on the lookout for the true buyer behaviors that logically indicate a sale is around the corner. Take-away. View your most recent closed deals. What activities lead to those opportunities? Make an extensive list of every marketing activity that could have contributed to winning the customer. After pulling all the information you need, the next step is defining and ranking points according to level of importance. For example, if you know that your qualified leads are heavily visiting a product spec page before they become a customer, you would rank that web page higher on the point scale than other selected pages. On the demographics side, if you notice that qualified leads typically hold an executive level employment level, such as COO, you would rank any executive level demographic higher on the point scale. The goal of ranking your criteria is to identify the top performing areas to create a hierarchy for your point system to mirror. Take-away. Remember that behaviors, your web pages, and conversion levels can change. Be flexible with your rankings and adapt as necessary. Always be aware of any coming changes to web structure, large copy changes, or shifts in behavior. Above all, be ready to have the conversation of how to better represent the rankings of your criteria with your sales team. After ranking the most valuable pages, behaviors and conversion points, your point system can now be tailored to mirror your rankings that will make up your point system. For simplicity s sake, use a point system that goes from 0 to 100. You will thank me later when you aren t counting in the thousands for point values. Here is an example of how you can break down the explicit and implicit elements into a three tiered scoring program. 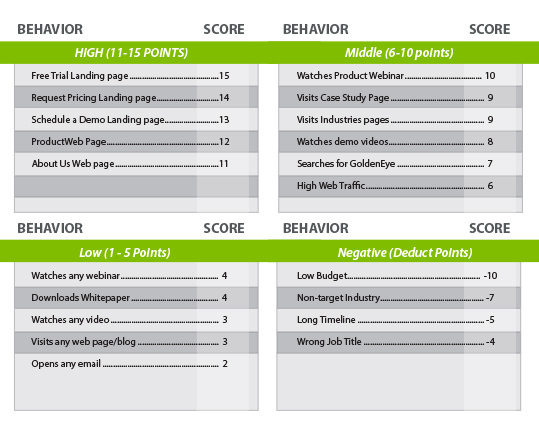 Once you align your scores with the rankings you have determined, you should be able to create a chart like this to outline every action or piece of data that you encounter and how it will effect the score. These scores will provide a clear picture of who is ready to become a purchasing customer. Take-away. Just because you can score everything under the sun, doesn t mean you should. Start small and work your way up. Begin with a scoring system you can easily keep track of and identify. Once you become comfortable with your lead scoring techniques, you can move on to something more advanced like assigning point values to social media signals, such as Facebook, Twitter and Linkedin engagement levels. Finally, remember to score based on your findings. Remember that data is there to help you get closer to the solution, so a not-so-good turn out simply means there is room for improvement. Review reports that show implicit information constantly, and don t forget to analyze form submissions that show new demographic information. Knee jerk reactions to large shifts are unwise, but don t sit for too long while the wrong leads are heading to sales wasting precious company resources. Be flexible and re-evaluate your lead scoring system time and time again. Information and data can change, which means your system must be flexible. Here s a tip. Be proactive. Don t let the wrong leads occupy the time of your sales team in vain. If you feel a change in lead scoring is the right thing to do, or a value should be reconsidered, back it up with as much data as possible and make the claim. Individuals that take a proactive approach to lead scoring are the ones that experience higher success rates. Successful lead scoring strategies aren t born overnight. It takes time, effort, trials and errors. Start your lead scoring strategy on the right path by understanding the critical elements, gathering and ranking the most relevant data and setting the scores based on your findings. Remember to stay close to your strategy by periodically revisiting your point system and committing changes as you see fit. If you re ready to increase the sales-ready leads and the overall effectiveness of your marketing tactics, follow these steps and experience the success that comes with a strong lead scoring strategy. Go on, your leads are waiting!